区博文, 张劲苗, 朱宇平, 黄慕嫦, 黄晓江, 黄悦志. 广东省江门地区2015-2017年白纹伊蚊密度监测及抗药性调查[J]. 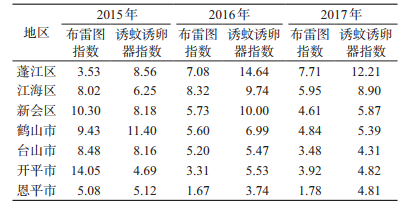 中国媒介生物学及控制杂志, 2018, 29(6): 621-624. OU Bo-wen, ZHANG Jin-miao, ZHU Yu-ping, HUANG Mu-chang, HUANG Xiao-jiang, HUANG Yue-zhi. 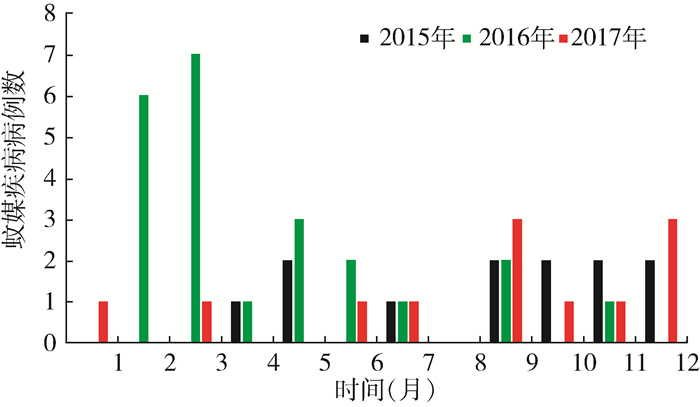 Study on the seasonal dynamics and insecticide resistance of Aedes albopictus in Jiangmen city, China, 2015-2017[J]. Chin J Vector Biol & Control, 2018, 29(6): 621-624. Abstract: Objective To understand the seasonal dynamics of Aedes albopictus and their insecticide resistance distribution in Jiangmen city and to provide the scientific basis for the prevention and control of mosquitoes. 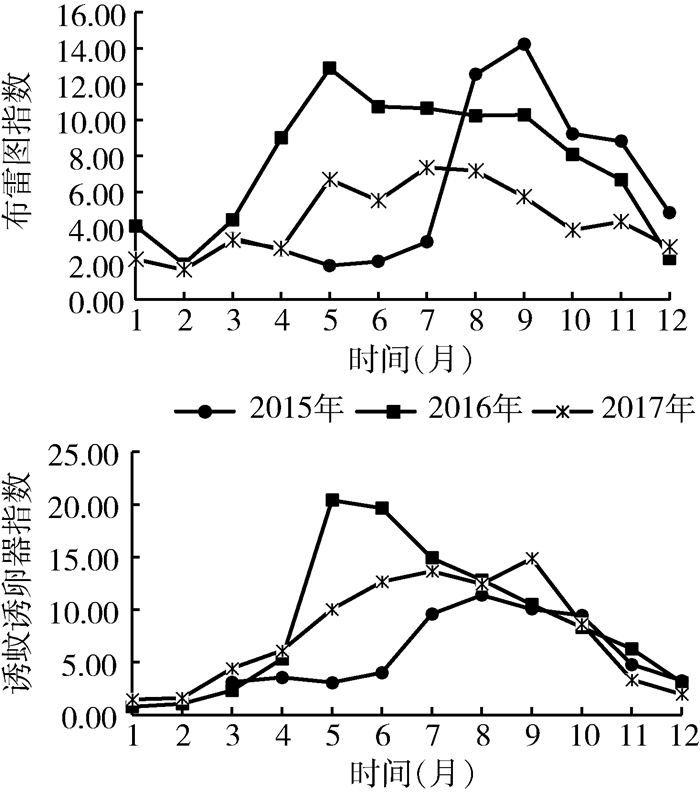 Methods Breteau index (BI) method and Mosquito oviposition positive index (MOI) method were utilized to conduct monthly monitoring in 7 counties of Jiangmen city during 2015-2017. Larvae resistance was tested by dipping method recommended by WHO. The median lethal concentration (LC50) was obtained by using SPSS 19.0 software for biometric data statistics, and the resistance distribution map was made by using Epi Info 3.5.3 software according to the resistance level. Results Mosquito density showed one peak in most counties in 2015-2017, and the peaks were May and from July to September. The highest BIs were 14.23, 12.85, 7.36 and the highest MOIs were 11.39, 20.41, 14.86. The average values of BI and MOI showed that the density of mosquito in most counties were low. 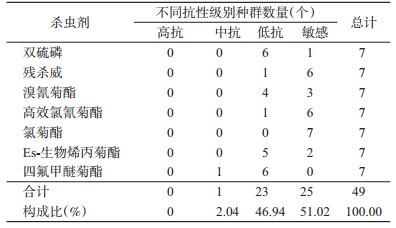 Seven population of larval mosquitoes were susceptible to permethrin and showed sensitivity and low resistance to beta-cypermethrin, propoxur, deltamethrin, temephos, and Es-Bioallethrin. 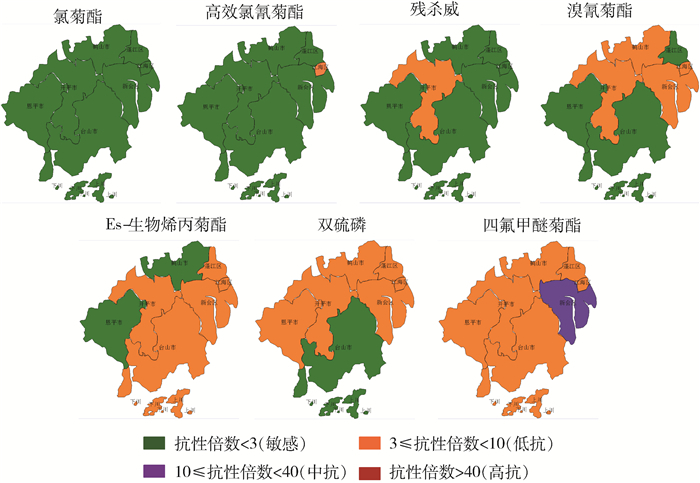 Xinhui district population developed medium resistance to dimefluthrin and the others had low resistance. Conclusion It is necessary to strengthen density and resistance surveillance of Ae. albopictus, and choose insecticides reasonably to delay the development of insecticide resistance and control mosquito-borne diseases effectively. 张海林. 新发和再肆虐虫媒病毒病是当前面临的重要公共卫生问题[J]. 中国媒介生物学及控制杂志, 2011, 22(2): 101-102, 120. 江毅民, 严子锵, 胡志刚, 等. 诱蚊诱卵指数作为蚊虫密度监测指标适用性的探讨[J]. 热带医学杂志, 2015, 15(11): 1555-1557. 严子锵, 胡志刚, 江毅民, 等. 广州地区白纹伊蚊自然种群幼虫密度指数变动及其影响因素[J]. 热带医学杂志, 2010, 10(5): 606-608. 李成玲, 严子锵, 江毅民, 等. 广州城区白纹伊蚊幼虫对常用杀虫剂的抗药性研究[J]. 中华卫生杀虫药械, 2013, 19(6): 487-489.